Will Starbucks Corporation's Stock Hit a New High After Earnings Next Week? Investors have good reason to be optimistic about this business heading into the fiscal Q2 announcement. Starbucks' (NASDAQ:SBUX) stock is trouncing the market, up 26% in the last year compared to a 3% decline for the S&P 500. Investors are still celebrating the coffee giant's awesome fiscal Q1 results that in January depicted a business firing on all cylinders: Sales spiked 12% higher, and profitability improved to a record 19.7% of sales as Starbucks dominated the holiday season. To keep that strong business momentum going, here's what shareholders will want to see when Starbucks posts its fiscal Q2 results on Thursday, April 21. CEO Howard Schultz and his team project that revenue will rise by 10% for the full fiscal year, which is exactly what consensus estimates call for this quarter. Sales are forecast to improve to just over $5 billion from last year's record $4.6 billion. An expanding store base will help that result, but the more important number to watch is comparable sales at existing locations. Comps soared by 8% last quarter, powered by a 4% gain in customer traffic. And while 4% might not seem like much, considering Starbucks' massive sales base, it's huge. The uptick translated into 23 million additional customer visits around the world last quarter as the coffee giant handled 18 million more transactions in its U.S. stores alone. Look for initiatives like an expanded lunch menu, digital ordering, and loyalty card marketing to help drive customer traffic growth this quarter, ideally without too much of a slowdown from Q1's banner result. It's hard to overstate the recent success of Starbucks' consumer packaged goods division, CPG, which sells packaged coffees and single-serve drinks in grocery stores and other retailing spots. Schultz wasn't exaggerating when he told investors last quarter that "no national or global retailer has been able to leverage a retail store footprint into a CPG business remotely approaching the size, scale, and profitability of ours." Last quarter, the CPG division grew 16%, to put it in second place in packaged coffee behind food product giant Kraft. Profits grew even faster, leading to a 2-percentage-point boost in operating margin to 38% of sales. CPG's margin makes it Starbucks' most profitable operating segment by far. New product launches including Starbucks brand latte K-Cups, combined with growing demand for Frappuccino and Double Shot drinks, should help keep market share growing this year even as the company expands its ready-to-drink reach into new markets like China and the Middle East. 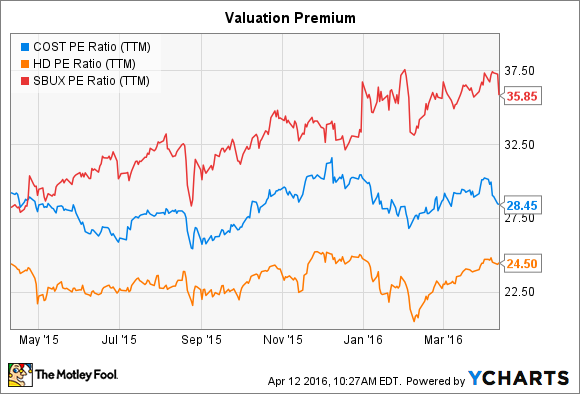 COST P/E Ratio (TTM) data by YCharts. This optimism raises the risk that investors could be disappointed with operating results in any given quarter. It isn't likely, after all, that the retailer can keep posting such consistently high customer traffic growth numbers for much longer. However, Starbucks has a stronger brand and better growth profile than any other global retailer right now. It's also one of the best-positioned companies to attack potentially game-changing long-term opportunities like a growing middle class in China, or food and drink delivery across the U.S. Given those unique advantages, I wouldn't be surprised to see shares set new highs even though the stock seems expensive heading into next week's announcement.